If you are looking for a place where you can feel fresh and enjoy the beauty created by God then Phewa Lake will be the most suitable place for you, where you can find fresh water and beautiful greenery which brings the feeling of refreshment and joy in you. It is thought that if you are tired of being following the regular work stream and daily routine and want a break where you can go out and enjoy with your family then Phewa Lake is the best place for you. Where you can get rid of your frustration and enjoy your visit by seeing beautiful place where you can find various kinds of birds, trees and other things. 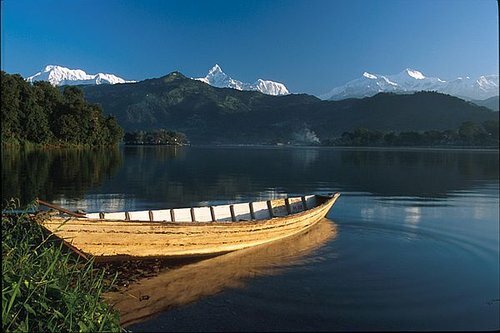 Talking about the location of Phewa Lake, the Lake is located in the south of the Pokhara Valley a beautiful city of Nepal. The lake surrounds the area of Pokhara city and passes through few parts of Sarangkot and Kaskikot. It is noticed that the lake is considered as the second largest lake of Nepal due to having a dam on it which is used to reserve the water resources for the nearby cities situated. The lake covers the area of 5.23 square Kilometer with the average depth of 28 feet and the maximum depth of 75 to 80 feet. Talking about the water reservation capacity of the lake, the lake is able to store water of about 43 million cubic feet which is a huge reservation rate. The most famous thing and the scene which will affect you are the reflection of mount Machhapuchhre and nearby mountains of Annapurna and Dhaulagiri which increase the beauty of the lake and when you see the reflection in water it delights you and brings a change in you. Another thing which must be visited when you come here on Phewa lake is the temple of Taal Barahi which is situated on the island of the lake. The temple is considered as the religious monument of the Nepal and people from around the world came here to visit this place. Other than this their eastern lakeside which is called Baidam is also a center of attraction for you as it contains all the facilities in which you will find hotels, restaurants, markets, lodges etc. where you can enjoy the traditions of Nepal in a proper way.